Since I was a child, I’ve enjoyed coloring. With crayons. I didn’t care much for colored pencils. Probably because there weren’t as many color options as in my box of 96 crayons. But crayons are too messy for the new adult coloring books. For books with good quality paper, I’ve discovered that I like gel pens. Everything looks sharper in ink. However, not just any pen will do. Pilot pens, which are my favorite for writing are terrible for coloring. Of course you can get special pens at places like Hobby Lobby. Coloring is a hobby that I’m not willing to spend a lot of money on. I might spend $40 on yarn, but not pens. That’s why I was excited to find a set of Wal-Mart gel pens for $5. The cheapness makes them terrible for writing, but perfect for coloring. The yellow sparkle pen was exactly what I needed for Belle’s dress. 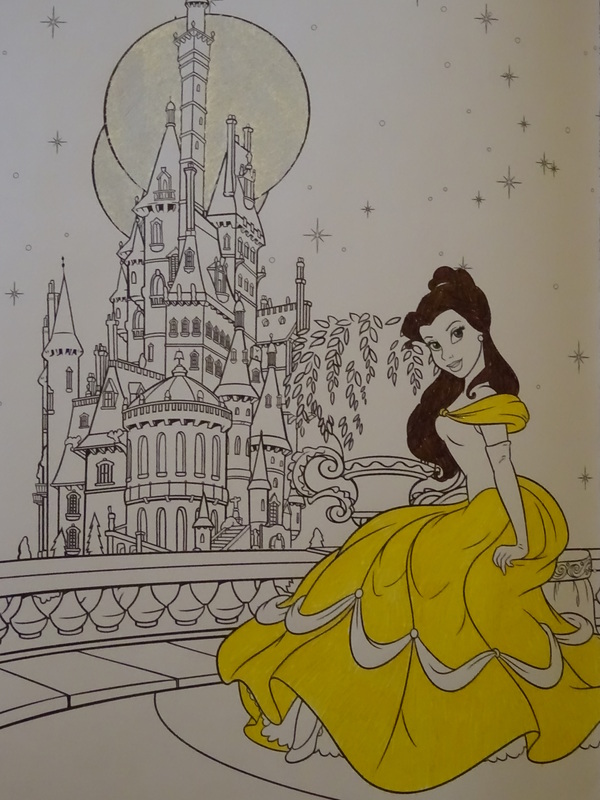 Belle’s dress and the moons were colored with Casemate fashion gel pens. Belle’s hair was colored with a Stabilo 88 pen (which I also like). The picture comes from the Art Therapy Disney Princess coloring book. As I mentioned in an earlier post, I’ve spent most of my life being purposefully anti-fad. I never had a Furby or a Cabbage Patch doll. I never wore skinny jeans or bell-bottoms. And I didn’t wear make-up until I was a junior in college. I have never read nor watched Harry Potter, Twilight, or The Hunger Games. All this made me think of fads that I did/am participating in. I have lost count of my Beanie Babies. My grandmother always got us a few for Christmas. I keep my Princess Di bear in a plastic case. Then there’s Captain America. All the Avengers, but especially Captain America. I am anxiously waiting for Civil War to come out on dvd (because I don’t go to theaters) before I find out all the spoilers (which unfortunately was not the case with The Force Awakens). I am also looking forward to the release of the live-action Beauty and the Beast. According to Oh My Disney quizzes, if I were a princess, I’d be Belle. Coloring is the new fad on the market. You’ll see commercial for coloring books, find them on the grocery store check-out aisle and recommended on Amazon. It’s the new thing in relaxation. Where did it start? I have not idea, but I like it. I never outgrew coloring. I still have my Precious Moments coloring book and box of crayons. The problem was that the coloring books available were for children. I didn’t watch Sesame Street as a kid, why would I want to color it as an adult? Not a problem anymore. Adult coloring books are everywhere. Of course a bunch of them are just mandalas which I find pointless. I want to color real pictures. But this coloring fad is annoying too. Whenever I talk about coloring or make a coloring purchase people assume I’m following the fad. Nope. Not so. I’ve been doing this for a while.